Background: Brainstem gliomas account for approximately 25% of all posterior fossa tumors. In pediatric age group, it constitutes about 10% of all brain tumors. Brainstem glioma is an aggressive and lethal type of malignancy with poor outcome despite all treatments. Aim: We studied the incidence and treatment outcome in pediatric patients with brainstem glioma depending on their tumor volume presenting in our institution in last 5 years. Brain tumors comprised 2.95% of all cancers and brainstem gliomas were 8% of all brain tumors. Materials and Methods: Nine pediatric patients were included in this analysis, who were treated with localized external radiotherapy 54–59.4 Gy along with temozolomide 75 mg/m2 during the whole course of radiotherapy. Results: The median survival in all these patients was 20 months and the overall 2 years survival is 44.4% (4/9). 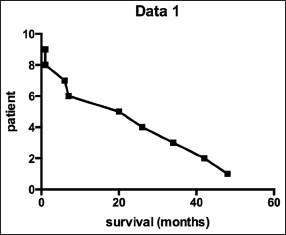 The median survival of patients with primary disease volume <40cc is 26 months whereas when the volume is more than 40cc the median survival is 13.5 months as calculated by Chi-square test. Conclusion: As this study includes a small number of patients with unknown histology and treated on the basis of magnetic resonance imaging findings, no definite opinion can be given as some patients may have a low-grade tumor. More studies are required to establish the relation of size of the tumor with survival. The brainstem is comprised of midbrain, pons and medulla and brainstem gliomas are tumors arising from these structures. The prognosis for children with diffuse brainstem gliomas is dismal due to its deep and critical location and its transient response to radiotherapy and is also refractory to chemotherapy. A number of combinations of concurrent chemotherapy and radiotherapy trials have been reported but have not shown any significant impact on the outcome of these patients. A number of tumor-related factors have been studied to assess their role in predicting the survival  but no one has studied the size of the tumor as a predictive factor. The primary aim of our study is to assess the outcome of our pediatric patients treated uniformly in this institution and establish the relation of size of the primary tumor with survival after treatment with concurrent chemotherapy with temozolomide and external radiotherapy. Between January 2010 and August 2014, we identified a total of 14 cases of brainstem gliomas out of a total of 5917 cases registered in our institution. Brain tumors comprised 2.95% of all cancers and brainstem gliomas were 8% of all brain tumors. Ten patients of all brainstem gliomas were between 5 and 16 years age. One patient whose Karnofsky performance status (KPS) was 30 died 1 day after registration hence there were only 9 pediatric patients who were included in the analysis. Rest 4 patients were 19, 40, and 50 and 60 years old and hence were not included in the analysis. The chief presenting complaints were headache, vomiting, giddiness, and weakness of variable duration. Some patients had diplopia, left sided paralysis also. Magnetic resonance imaging (MRI) in most of the patients showed diffuse lesion [Figure 1],[Figure 2],[Figure 3]. In brainstem gliomas, histopathological confirmation is not mandatory and hence was planned for concurrent chemotherapy with temozolomide 75 mg/m 2 daily empty stomach to be given before radiotherapy along with external radiotherapy. To start radiotherapy, first an immobilization cast is made, and the computed tomography (CT) scan is done along with the cast and 3 mm sections are taken. 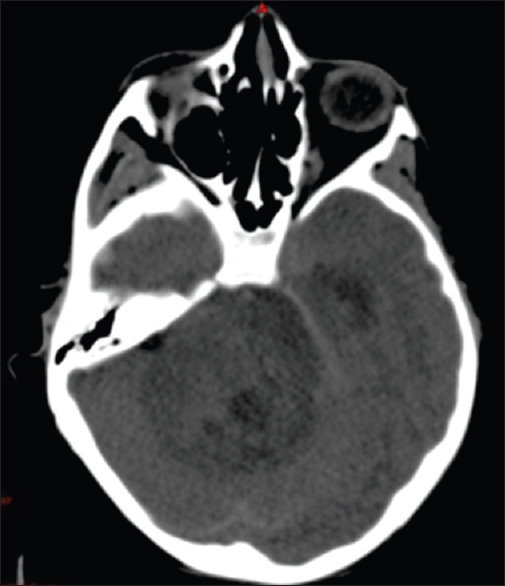 This scan is imported in the Eclipse treatment planning system along with T2-weighted MRI scan of the patient. The CT and MRI images are fused using the software available in the planning system and then contoured for target volume assessment and treatment. The gross tumor volume (GTV) including the primary lesion was marked in all cases. The clinical target volume included the GTV and the edema, and then a margin was given to make planning treatment volume (PTV). The volume of the tumor was recorded in each case as per the GTV volume. All patients received a dose of 54–59.4 Gy in 30–33 fractions to PTV with three-dimensional conformal radiation therapy or intensity modulated radiation therapy techniques with 6 MV photons on a linear accelerator. All the patients received mannitol and dexamethasone to take care of radiation-induced cerebral edema during the first 3 days and then was maintained with oral steroids. There was no gap during the treatment in all the patients due to either radiation or chemotherapy toxicity. Only 7 patients out of 9 completed the prescribed treatment, and the other 2 died after receiving 4 and 10 fractions of radiotherapy along with temozolomide. Both of them did not have any chemotherapy or radiation-induced toxicity and died due to poor general condition and advanced disease. Only 7 patients completed the treatment out of 9 pediatric patients with brainstem glioma. Two patients could not complete the treatment and died after receiving 4 and 10 fractions of radiation, due to the disease as their KPS before starting the treatment was about 30 and 40, respectively. Most of the patients had a diffuse and infiltrative lesion on MRI [Figure 1],[Figure 2],[Figure 3]. The mean GTV volume of the lesion in these 9 patients was 53,58cc. Five patients had volume <40cc and 4 had volume more than 40cc [Table 1]. The median survival in all these patients was 20 months and the overall 2 years survival is 44.4% (4/9). The median survival was affected by the size of the primary tumor. The median survival of patients with primary disease volume less than 40cc is 26 months whereas when the volume is more than 40cc the median survival is 13.5 months. The two-tailed P = 0.7665 and by conventional criteria, this difference is considered to be not statistically significant. Only 3 patients had grade II neutropenia and occasional vomiting, and all had alopecia at the site of radiation and grade I skin reaction due to radiotherapy. None of the patients required gap during the treatment due to toxicity and no additional supportive care was required. The 3 patients who are surviving at 7, 42, and 48 months are asymptomatic and leading a normal life. Two of these patients have small volume disease. There is no apparent late cerebral radiation effect seen in the surviving patients. Brainstem gliomas account for approximately 25% of all posterior fossa tumors and are most common in children between 7 and 9 years of age. There is no recognized gender or racial predilection. In children, brainstem gliomas constitute about 10% of brain tumors. In contrast, brainstem gliomas in adults are poorly understood because they are quite unusual, accounting for <2% of gliomas. They typically occur in younger adults (third and fourth decade) and tend to be of low-grade (WHO I or II). Brainstem glioma is an aggressive and lethal type of cancer affecting hundreds of children each year. As it infiltrates healthy tissue in the critical structures of the brainstem, surgical treatment is questionable, and the prognosis remains poor. The patients with diffuse brainstem glioma on MRI scans do not benefit from surgical intervention while most of the other types of tumors involving the brainstem can be surgically removed with acceptable mortality and morbidity. Radiation therapy is the mainstay of treatment for the past three decades with recommendation of conventionally fractionated radiation dose of 54–60 Gy over 6 weeks. Hyperfractionated therapy has not shown improvement in survival in multiple studies and was associated with increased side effects.,,, Newer studies suggest that hypofractionated therapy may offer comparable overall survival with reduced burden on the patient and family., The aim of this study is to establish the relation of size of the primary tumor with survival after treatment [Graph 1 [Additional file 1]]. Only a few studies have assessed the role of chemotherapy either as single  or as combination therapy , with no significant improvements in progression or survival time. A trial of concurrent carboplatin and etoposide with 70.2 Gy of hyperfractionated radiotherapy did not improve outcome over radiotherapy alone (2-year survival rate, 11%). A randomized trial by Pediatric Oncology Group with concurrent chemotherapy and dose escalation also showed no significant benefit over conventional treatment. In a study from Indian subcontinent Jalali et al., has shown a median survival of 9.15 months but this study did not show any improvement with the addition of temozolomide to radiotherapy. Similarly, no survival benefit was there with the addition of chemotherapy regimen of lomustine, vincristine, and prednisolone. Other chemotherapeutic drugs such as interferon, bradykinin, RMP-7, cyclosporine, and tamoxifen with or without radiotherapy also did not show any survival advantage., Despite the initial positive responses observed among children with high-grade gliomas treated with temozolomide in phase I trials, Broniscer et al. reported that administration of temozolomide after radiotherapy, as an adjuvant therapy, does not change the poor outcome of children. He showed results of a multi-institutional study examining the role of neoadjuvant irinotecan followed by radiotherapy and then temozolomide. Median survival was only 12 months with a high incidence of hematologic toxicities. Cohen et al. presented a summary of 61 patients treated with concurrent temozolomide and radiotherapy, followed by adjuvant temozolomide with 1-year OS rate of only 39%. They also concluded that temozolomide does not improve the outcome in children with brainstem glioma. However, in our study where we have given temazolomide concurrently with radiotherapy in pediatric patients, the median survival is better when compared to all the other studies. Another study using a combination of temozolomide and cis-retinoic acid with radiotherapy has also failed to show any significant advantage. Biological agents such as the anti-epidermal growth factor receptor agent Nimotuzumab have shown some promise in a preliminary phase II study. A major limitation in conducting any molecular or biological studies is the lack of tissue diagnosis. In studies of brainstem glioma treated with chemotherapy and/or radiotherapy, the median overall survival ranged from 8 to 11 months. Our study found the median survival of 20 months and the overall 2-year survival of 44.4% which is longer than the previous studies. However, in our study only pediatric patients were taken and the patients who have survived longer have small size of the lesion which may not have infiltrated much and possibly could be a low-grade lesion hence our study has shown a good median survival as compared to all other studies. However only a small number of patients were included in this study so we cannot say whether addition of temozolomide improved the survival. 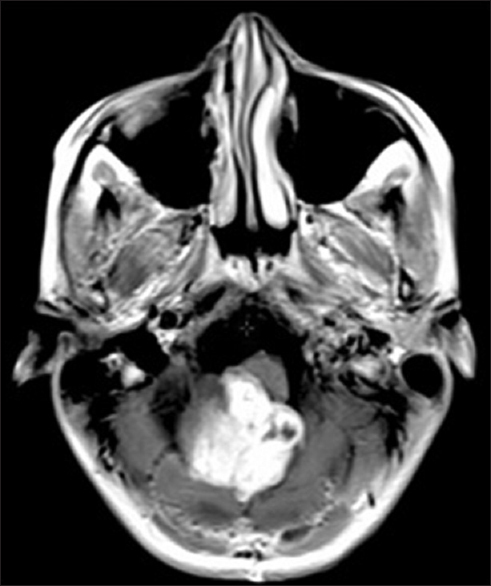 The size of the primary tumor also affected the survival in patients of brainstem glioma. This study shows that when the volume of tumor is less than 40cc the survival is good with radiotherapy and temozolomide combination. In few studies, it is found that longer duration of symptoms show a good prognosis, but there is no relation documented with the size of the tumor. We could not find any literature which showed the relation of volume of the disease with survival in pediatric age group. More studies are required to establish the relation of volume of the tumor with survival. This study is a very small case series of 9 patients only without proven histology and treated on the basis of MRI findings so we cannot conclude superiority of combination treatment in improving the survival. The P value for the relation of size of the tumor with survival is also not significant hence a definite relation cannot be established, and more studies with a large number of patients is required. Goda JS, Dutta D, Raut N, Juvekar SL, Purandare N, Rangarajan V, et al. Can multiparametric MRI and FDG-PET predict outcome in diffuse brainstem glioma? A report from a prospective phase-II study. Pediatr Neurosurg 2013;49:274-81. Cohen KJ, Broniscer A, Glod J. Pediatric glial tumors. Curr Treat Options Oncol 2001;2:529-36. Packer RJ, Allen JC, Goldwein JL, Newall J, Zimmerman RA, Priest J, et al. Hyperfractionated radiotherapy for children with brainstem gliomas: A pilot study using 7,200 cGy. Ann Neurol 1990;27:167-73. Freeman CR, Krischer JP, Sanford RA, Cohen ME, Burger PC, del Carpio R, et al. Final results of a study of escalating doses of hyperfractionated radiotherapy in brain stem tumors in children: A pediatric oncology group study. Int J Radiat Oncol Biol Phys 1993;27:197-206. Packer RJ, Zimmerman RA, Kaplan A, Wara WM, Rorke LB, Selch M, et al. 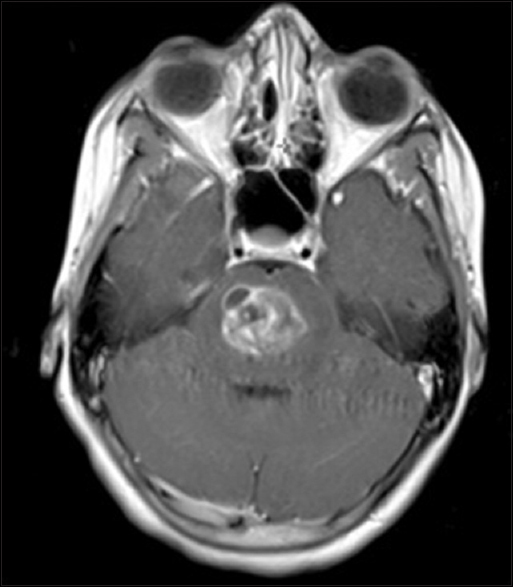 Early cystic/necrotic changes after hyperfractionated radiation therapy in children with brain stem gliomas. Data from the Childrens Cancer Group. Cancer 1993;71:2666-74. Mandell LR, Kadota R, Freeman C, Douglass EC, Fontanesi J, Cohen ME, et al. There is no role for hyperfractionated radiotherapy in the management of children with newly diagnosed diffuse intrinsic brainstem tumors: Results of a pediatric oncology group phase III trial comparing conventional vs. hyperfractionated radiotherapy. Int J Radiat Oncol Biol Phys 1999;43:959-64. Negretti L, Bouchireb K, Levy-Piedbois C, Habrand JL, Dhermain F, Kalifa C, et al. Hypofractionated radiotherapy in the treatment of diffuse intrinsic pontine glioma in children: A single institution's experience. J Neurooncol 2011;104:773-7. Zaghloul MS, Eldebawy E, Ahmed S, Mousa AG, Amin A, Refaat A, et al. Hypofractionated conformal radiotherapy for pediatric diffuse intrinsic pontine glioma (DIPG): A randomized controlled trial. Radiother Oncol 2014;111:35-40. Allen J, Siffert J, Donahue B, Nirenberg A, Jakacki R, Robertson P, et al. A phase I/II study of carboplatin combined with hyperfractionated radiotherapy for brainstem gliomas. Cancer 1999;86:1064-9. Bernier-Chastagner V, Grill J, Doz F, Bracard S, Gentet JC, Marie-Cardine A, et al. Topotecan as a radiosensitizer in the treatment of children with malignant diffuse brainstem gliomas: Results of a French society of paediatric oncology phase II study. Cancer 2005;104:2792-7. Bouffet E, Raquin M, Doz F, Gentet JC, Rodary C, Demeocq F, et al. Radiotherapy followed by high dose busulfan and thiotepa: A prospective assessment of high dose chemotherapy in children with diffuse pontine gliomas. Cancer 2000;88:685-92. Walter AW, Gajjar A, Ochs JS, Langston JW, Sanford RA, Kun LE, et al. Carboplatin and etoposide with hyperfractionated radiotherapy in children with newly diagnosed diffuse pontine gliomas: A phase I/II study. Med Pediatr Oncol 1998;30:28-33. Korones DN, Fisher PG, Kretschmar C, Zhou T, Chen Z, Kepner J, et al. Treatment of children with diffuse intrinsic brain stem glioma with radiotherapy, vincristine and oral VP-16: A children's oncology group phase II study. Pediatr Blood Cancer 2008;50:227-30. Jalali R, Raut N, Arora B, Gupta T, Dutta D, Munshi A, et al. Prospective evaluation of radiotherapy with concurrent and adjuvant temozolomide in children with newly diagnosed diffuse intrinsic pontine glioma. Int J Radiat Oncol Biol Phys 2010;77:113-8. Jenkin RD, Boesel C, Ertel I, Evans A, Hittle R, Ortega J, et al. Brain-stem tumors in childhood: A prospective randomized trial of irradiation with and without adjuvant CCNU, VCR, and prednisone. A report of the Childrens Cancer Study Group. J Neurosurg 1987;66:227-33. Broniscer A, Leite CC, Lanchote VL, Machado TM, Cristófani LM. Radiation therapy and high-dose tamoxifen in the treatment of patients with diffuse brainstem gliomas: Results of a Brazilian cooperative study. Brainstem Glioma Cooperative Group. J Clin Oncol 2000;18:1246-53. Greenberg ML, Fisher PG, Freeman C, Korones DN, Bernstein M, Friedman H, et al. Etoposide, vincristine, and cyclosporin A with standard-dose radiation therapy in newly diagnosed diffuse intrinsic brainstem gliomas: A pediatric oncology group phase I study. Pediatr Blood Cancer 2005;45:644-8. Broniscer A, Iacono L, Chintagumpala M, Fouladi M, Wallace D, Bowers DC, et al. Role of temozolomide after radiotherapy for newly diagnosed diffuse brainstem glioma in children: Results of a multiinstitutional study (SJHG-98). Cancer 2005;103:133-9. Sirachainan N, Pakakasama S, Visudithbhan A, Chiamchanya S, Tuntiyatorn L, Dhanachai M, et al. Concurrent radiotherapy with temozolomide followed by adjuvant temozolomide and cis-retinoic acid in children with diffuse intrinsic pontine glioma. Neuro Oncol 2008;10:577-82. Bode U, Windelberg M, Massimino M. Phase III trial of nimotuzumab for the treatment of newly diagnosed diffuse intrinsic pontine gliomas in children and adolescents. J Clin Oncol 2008;26 Suppl 15S:2058. Hargrave D, Bartels U, Bouffet E. Diffuse brainstem glioma in children: Critical review of clinical trials. Lancet Oncol 2006;7:241-8.